Vancouver, British Columbia, June 20, 2018 – Pacton Gold Inc. (TSXV: PAC, OTC: PACXF) (the “Company” or “Pacton”) is pleased to announce that it has entered into a binding letter of intent (“LOI”) to acquire 100% of the Bellary Dome (“Bellary Dome”) exploration license 47/2555 from Marindi Metals Inc. (MZN:ASX) (“Marindi”). Located on the southern margin of the Hamersley Basin and surrounded by Novo Resources Ltd. (NVO:TSXV). Hosts approximately 25 km of strike extent of the basal contact between the Mt. Roe Basalt and the conformably underlying Bellary Formation with widespread fine visible gold panned across the project. Over six (6) ounces of coarse nuggets recovered from one alluvial “trap site”, located directly downslope from mapped Bellary Formation conglomerate; nuggets are pitted, flattened, and elongate “watermelon seeds”. Stratigraphic position of the conglomerates within the Bellary Dome Project is similar to the gold-bearing horizon at the Comet Well/Purdy’s Reward Projects. Nature of nuggets recovered is very similar to those recovered by Novo Resources approximately 250 km to the north. Contains several km of Hardey Formation and more recently, work by others, has confirmed the prospectivity of the Beatons Creek Member of the Hardey Formation. 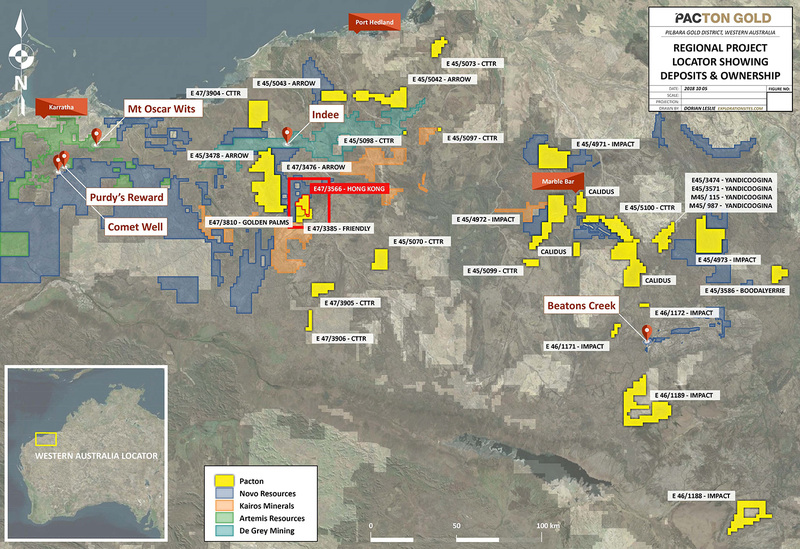 “Marindi’s initial work at Bellary Dome has only just begun to highlight the potential for this to be just one part of a much larger regional gold play across the Pilbara region of Western Australia. Conglomerate-gold-focused Pacton Gold has purposefully acquired an extensive land-holding of high-value projects across the region and the Bellary Dome project would be a natural fit to that portfolio. Marindi is pleased to have the opportunity to be invested in such a dynamic and focused conglomerate gold explorer, best placed in taking the Bellary Dome conglomerate gold project forward,” stated Simon Lawson, Managing Director of Marindi. ELA 47/3555 is located on the Bellary Dome, and covers approximately 25 km of the basal contact of the Mt. Roe Basalt, where it conformably overlies the Bellary Formation. The Bellary Formation is described by the Geological Survey of Western Australia (GSWA) as the lowermost unit of the Fortescue Group and comprises fine grained sediments, sandstone, interbedded conglomerate, basaltic breccia and tuff. The recent discoveries at Purdy’s Reward occur in conglomeratic beds interbedded with sandstone units lying conformably below the Mt Roe Basalt and it is believed this to be the equivalent position of the Bellary Formation. The prospectivity of the tenement is further highlighted by the presence of numerous alluvial gold workings, prospecting pits with gold values ranging from anomalous to 38.2g/t Au, and recent modern gold prospecting activity. The selected samples are not necessarily representative of mineralization at Bellary Dome and there are no assurances the Company will receive similar results. The Bellary Dome occurs on the southern edge of the Hamersley Basin where formations of the Lower Fortescue Group occur. Tenements neighbouring ELA 47/3555 are held by companies also conducting exploration for gold-in-conglomerate, including Novo Resources, Southern Hemisphere Resources and Hardey, whereas the majority of tenements in the Southern Pilbara remain in the hands of predominantly iron ore focused companies. ELA 47/3555 also hosts 10 km of Hardey Sandstone which sits conformably above the Mt Roe Basalt on the southern side of the ELA. This will also be assessed given the Beatons Creek conglomerate, which is associated with gold production at Nullagine in the East Pilbara, is also a member of the Hardey Sandstone. Under the terms of the LOI, which will be formalized by a definitive agreement among the parties, the Company must pay C$2,000,000 and issue 10,098,000 common shares on closing of the transaction. The Company must also pay C$1,000,000 or issue shares equal to that amount both on 12 months and 18 months after completion of the transaction. Sprott Capital Partners will receive a fee for acting as advisory with respect to the transaction in the amount of 750,000 common shares of the Company. The technical content of this news release has been reviewed and approved by Peter Caldbick, P.Geo., a director of the Company and a Qualified Person pursuant to National Instrument 43-101. The qualified person has not visited the Bellary Dome site and therefore has not verified the data disclosed, including sampling, analytical, and test data underlying the information or opinions contained in the written disclosure. This news release may contain or refer to forward-looking information based on current expectations, including, but not limited to the Company completing the proposed transaction described herein, the prospect of the Company achieving success in exploring the Bellary Dome and the impact on the Company of these events, including the effect on its share price. Forward-looking information is subject to significant risks and uncertainties, as actual results may differ materially from forecasted results. Forward-looking information is provided as of the date hereof and we assume no responsibility to update or revise such information to reflect new events or circumstances. References to other issuers with nearby projects (Novo Resources Corp.) is for information purposes only and there are no assurances the Company will achieve similar results.